The area of North Devon is known best for its dedicated crew of surfers, mainly due to its close proximity to world-class surfing beaches. But what do these board-sport enthusiasts do when the ocean goes flat and the waves are scarce? Well, we skate! Trading one board with fins for another with wheels is common practice for local riders hailing from the region who can be seen tearing up the local skate parks. Skating has grown massively in the area, mainly due to the unique spots where local and visiting skaters congregate. Whether you are a mini ramp rider, or a raw street skater, the area has it all. I’m going to outline a few of my favourite spots, which you should definitely check out! Rock skatepark is the place to be. This diverse, concrete and brick area has become the ‘go-to’ place in the local area. 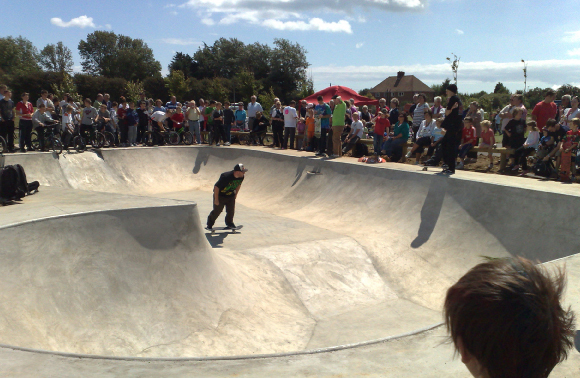 Situated within the ever so popular Rock Park, the skate facility was created by Gravity Skate parks in 2009. Due to the super high quality of this park, an official opening ceremony was hosted with the Vans skate team, including Marc Churchill, Darryl Nobbs and Manhead all in attendance. So what’s it got? Well this open air skate spot has a vintage Californian skate park feel to it. Indeed it is very unique for the UK. You expect to see this type of thing in a 90’s skate flick with long-haired dudes cruising the concrete banks on Penny boards. With steps, fire hydrants, rails and seamless transitions, this mid-sized concrete area is a street skater’s paradise. What makes this park so special is the unique brickwork that has been used to cover flat-banks, and even quarter-pipes. This gives a complete different feel under your wheels, and is superb to ride on. For the traditional bowl rider, this place is also a must! The multi-levelled bowl allows you to cruise the perfect transitions and even hit a few airs if that’s your thing. This park oozes originality, so if you are a serious skater, of any level, then there will be something here for you. Certain areas present concrete coping which is very rare nowadays. The park has floodlights and CCTV, so you’re going to be safe skating into the late hours, or on dark winter evenings. The park can get quite busy, so during the week and term-time will offer the best sessions, allowing you to avoid the hordes of kids on scooters. To get there, head for Taw Vale in the centre of Barnstaple, the large park cannot be missed. When we want to mix it up a little bit, we head over to the beautiful seaside town of Ilfracombe. Nestled between the rolling Devonshire hills and the edge of Exmoor National Park, Ilfracombe boasts another concrete playground. After the successful build of the Barnstaple park, Gravity were contracted again to work their magic on this location. The project cost £150,000 and therefore has plenty on offer for every type of skater. Slightly smaller than its Barnstaple big brother, yet presenting a different arrangement of obstacles that are perfect for the modern day skater. Again the park is a seamless heaven, and smoother than glass. One can draw flowing lines across banks, down steps and on top of ledges. It’s perfect for cruising as well as more aggressive skating, and ideal those planning on hitting the rails. Benricks is located just over ten miles north of Barnstaple, in the seaside town of Ilfracombe. Head to the Harbour and follow the road round on to Larkstone Lane. The park is generally less busy than its Barnstaple neighbour, yet there are still a handful of very progressive locals. Every skater knows that some of the best spots are located around the streets. Barnstaple especially, offers some top-notch obstacles that are at a skater’s disposal; just skate around and chat with the locals to find out where these spots are. 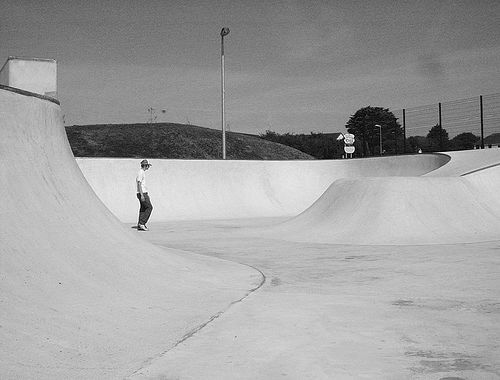 Many of the other major towns in North Devon have small skate parks too, such as; South Molton, Appeldore, Bideford, Braunton (bowl) and Torrington. Head towards Barnstaple along the A361, taking in the beautiful scenery of Exmoor, or check out thetrainline.com and nationalexpress.com. From Barnstaple there are many buses that run to Ilfracombe and surrounding towns. When Ben isn’t tearing up the Devonshire skate parks, you’ll find him working at Nucleus Skate shop, who specialise in skate shoes and urban clothing. This entry was posted in Europe, Land Sports, Skateboarding, Travel and tagged England, North Devon, Skateboarding. Bookmark the permalink.